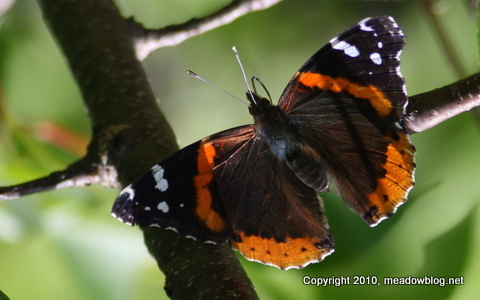 The Record's environmental writer, Jim O'Neill, had a nifty story today about Red Admirals (above) and other butterflies. The story is headlined "A Butterfly Bonanza for New Jersey," and it is a must-read for those who love butterflies. Speaking of butterflies, mark your calendar for Sunday, July 25: It's Butterfly Day at DeKorte Park. We'll have more announcements about this event in the coming days and weeks. A participant on a recent bird walk found a suspicious bug on his shirt, and asked us to find out what it was. 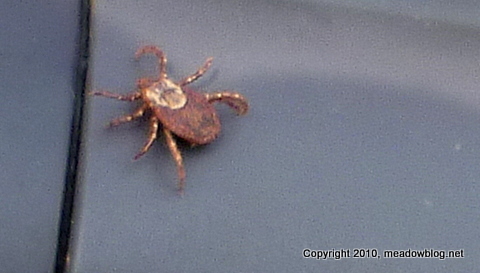 We photographed it and have now ID'd it as a dog tick. These ticks are mostly harmless (as opposed to deer ticks), but they serve as a reminder that ticks are certainly out there — all over Northern New Jersey – and that you should stay on trails, avoid brushing against shrubs and trees, and basically be on the look out should one get on your clothes. The N.J. Meadowlands Commission is sponsoring a two-hour clean-up at the Kearny Marsh this Sunday at 10 a.m.
We will clean the trails by foot, and the marsh by canoe. We'll also trim the trials. We’ll meet at the northeast corner of the Gunnel Oval off Schuyler Avenue at 10 a.m. (directions are on meadowblog.net in the left-hand column), or you can also meet us at the visitors’ parking lot at DeKorte Park in Lyndhurst at 9:40 a.m. and we can carpool. We’ll supply trash bags and water, but bring your own weed clippers and work gloves. We’ll also supply canoes, paddles and life vests. Check meadowblog.net for last-minute updates and weather advisories. To rsvp, contact Don Torino of the BCAS at greatauk4@aol.com or 201-636-4022.